Volkswagen have expanded their Crafter range with the arrival of an all-new Luton model. Priced from £32,470 and introduced as part of the manufacturer’s Engineered-to-Go selection, the variant has been designed and developed alongside bodybuilder Ingimex. It is based on the Crafter chassis, and delivers class-leading payloads and a vast load cube of 17m3. The van is constructed using GRP sides and bulkhead and a dip-painted and powder-coated bolted frame, with the finished bodies coming readily modified for the addition of a tail-lift. 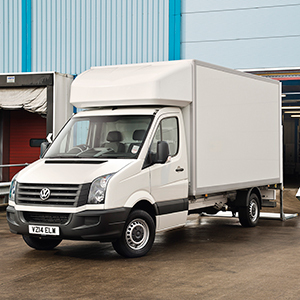 Standard features of the LCV include a four-tier load restraint system, a high-strength shutter and a rear foot step. It is offered in long wheelbase and comes with Volkswagen’s 2.0litre TDI engine in either 136PS or 163PS output. Andrew Waite, Head of Sales Operations for Volkswagen Commercial Vehicles, said: “We have teamed up with one of the best conversion specialists to design our new Luton Crafter. “It combines all the usual Crafter qualities of reliability, ease of use and low running costs, and adds an incredible load space for even greater practicality.